Nice is known as the capital of the French Riviera. It is the fifth largest city in France and the second largest French city on the Mediterranean. It is also the second most popular city in France to visit after Paris. What sets Nice apart is its overall atmosphere. In some ways, Nice looks back to the aristocratic elegance of its Belle Epoch heyday. At the same time, however, the city is contemporary, less rigid and more egalitarian than in the past. The city benefits from a warm but mild climate. (There are palm trees along its waterfront). It also has elegant architecture, cultural offerings and a variety of restaurants and cafes. Perhaps that is why so many people visit there. Nice was founded by the Greeks in 350 B.C. 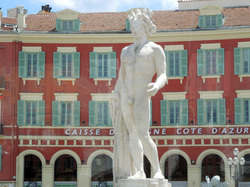 They named their settlement after the goddess Nike, which over the centuries has been corrupted into Nice. During its history, Nice has changed hands many times. It has been ruled by the Counts of Provence and the Duke of Guise. However, most of the time, it was under the control of the House of Savoy. Nice was captured by the army of revolutionary France and remained part of France through the Napoleonic era. However, after the fall of Napoleon, it was made part of the Kingdom of Piedmont-Sardinia. It was not until 1860 that Nice became a permanent part of France. The French under Napoleon III assisted Piedmont-Sardinia in a war against Austria and in return Piedmont-Sardinia ceded Nice to France. A plebiscite was held to confirm this change and the people voted overwhelmingly to become part of France. Although Giuseppe Garibaldi, who was born in Nice, claimed the vote was rigged, Nice has remained a French city ever since. In the late 18th century, members of the British upper classes began to winter in Nice. This practice blossomed in the 19th century as aristocrats from Russia and other Northern European countries joined the British. As a result, Nice became a haven for the rich and famous of that era. In World War II, Nice was occupied by the Italians and the Germans. It also suffered from Allied bombing raids made in preparation for the liberation of Southern France. Above: The Colline du Chateau (Castle Hill) where the original Greek settlement was started. On top of the hill today is a park and botanical gardens. Below: Roman ruins in the Cimiez quarter of Nice. Nice's most famous attraction is a four mile boulevard by the city's rocky beach. The British aristocracy who came to winter in Nice in the 18th and 19th centuries liked to stroll by the sea. Over time, the path where they walked developed from a dirt path into the most fashionable part of town. Today the Promenade des Anglais is more casual but still popular with both residents and visitors. People walk, jog, push baby strollers, skateboard and roller skate on "The Prom." 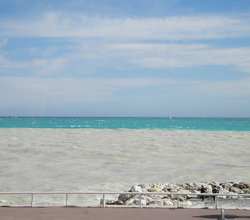 For the most part, the water along the sea front is a pale blue. However, there can also be mocha-colored water, the outflow of the River Paillon, which flows under the city. 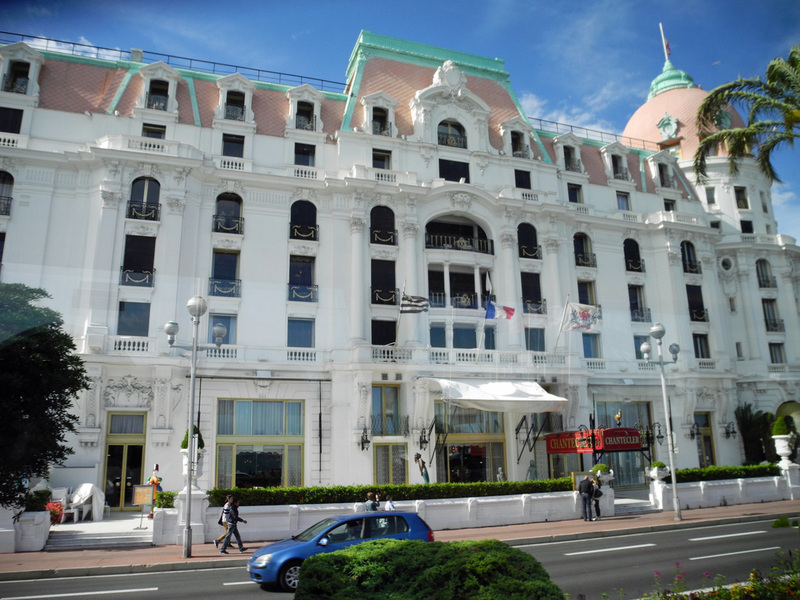 On the opposite side of the busy street from the seaside walkway are a series of elegant buildings erected during Nice's golden era. 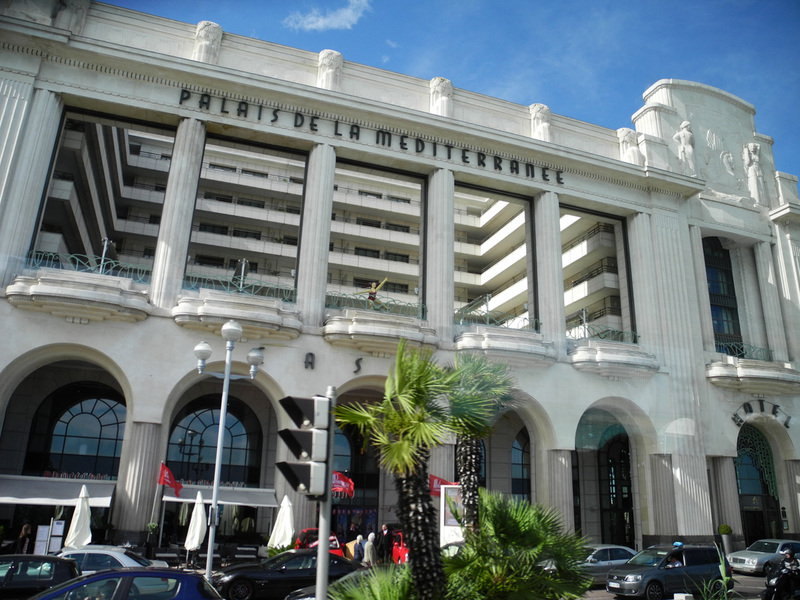 The Palais de la Mediterranee (below) was designed as a casino by Frank Lloyd Wright. It is now a hotel. The Hotel Negresco (above) built in 1912 is a French national landmark. Towards the eastern end of the street is the city's opera house, which dates from 1885 (right). The wealthy foreign visitors who came to Nice in the 19th century needed places to stay and as a result, Nice has numerous grand houses, apartment buildings and hotels built in the 19th and early 20th century. 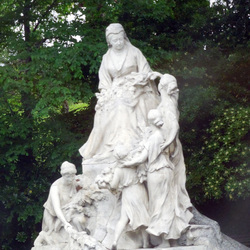 Queen Victoria (above) made several visits to Nice. She required an entire hotel wing to house her 100-person entourage. 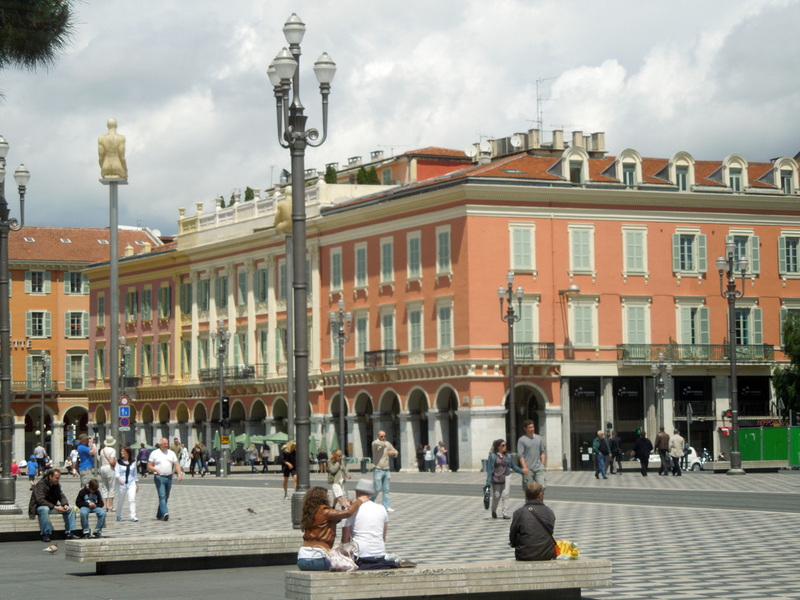 Nice's central square is a broad expanse surrounded by Italian-style buildings. It is the venue for large public events such as carnivals and the Bastille Day military parade. The new tram line runs through the square but the square is now part of a pedestrian zone with restaurants and cafes. On the eastern side of Nice is the Old City. Its narrow winding streets are home to restaurants, cafes and bars as well as elaborate Baroque churches. The best known attraction of the Old City is the Cours Saleya. This large square hosts and flower and vegetable market every day except Friday during which it becomes an antiques market. 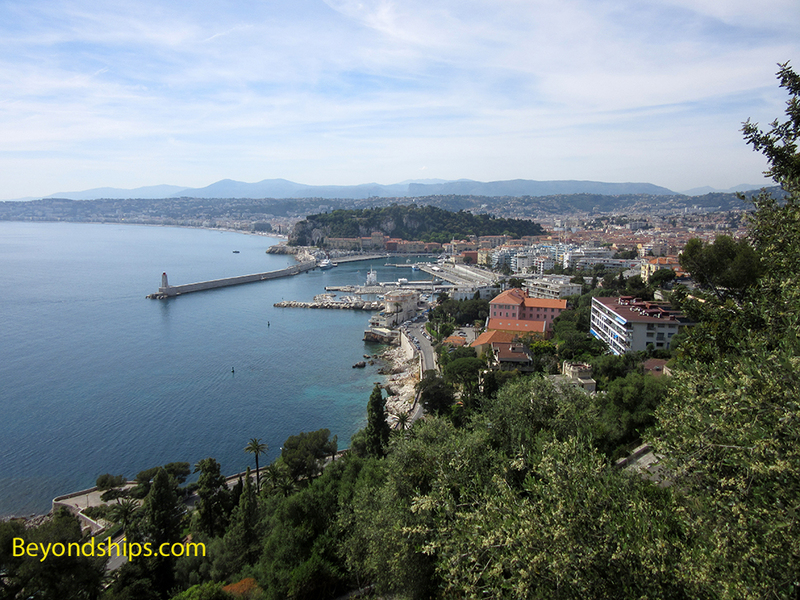 Nearby, there is the small old port of Nice, which is primarily used by yachts and pleasure craft these days. (This should not be confused with the commercial port where some cruise ships call on the other side of town). Not every building in Nice is old. 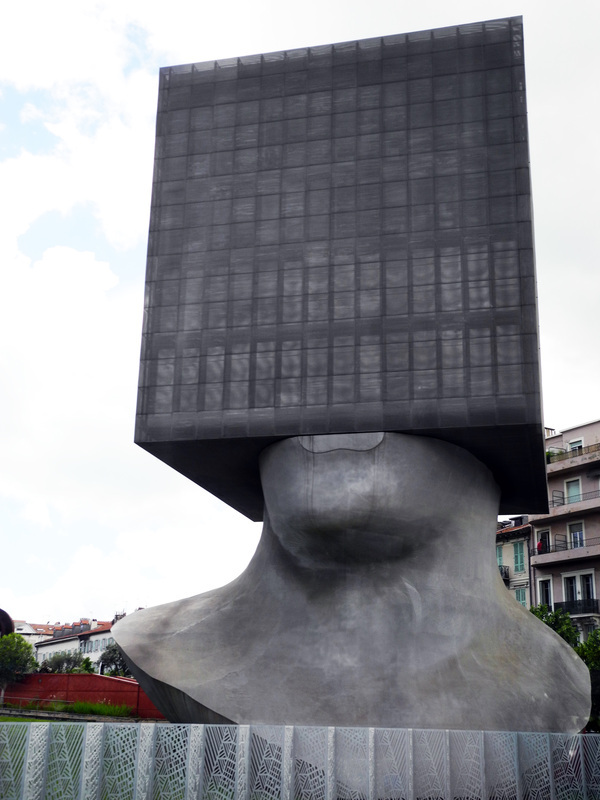 The Biblotheque Louis Nucera (public library) is a most unusual example of modern architecture (above left). Nearby is the Museum of Modern and Contemporary Art (above right). 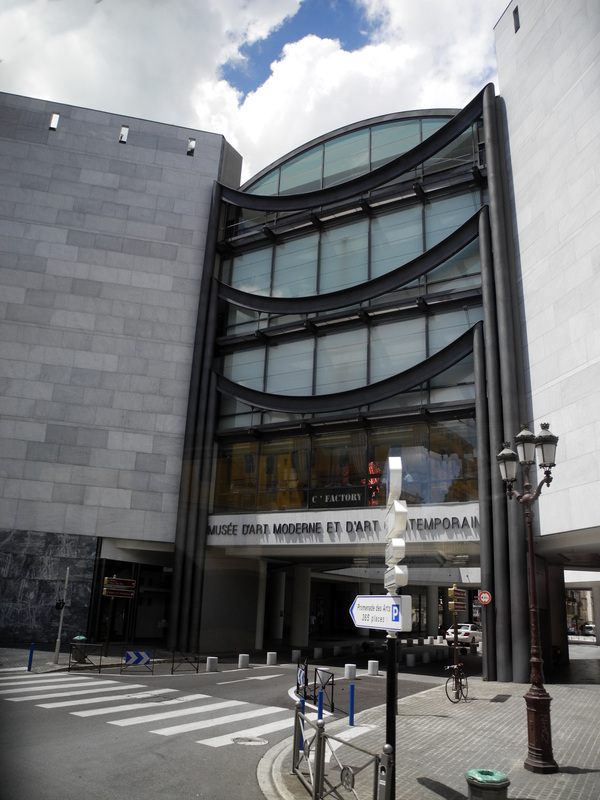 In fact, Nice has quite a few museums. Its soft light and warm climate have attracted artists for centuries. There is a museum dedicated aside solely to the works of Marc Chagall and one dedicated to the works on Henri Matisse (below left). The Musee Massena is a villa along the Promenade des Anglasis that once belonged to the family of Napoleon's Marshall Victor Massena. It is now dedicated to the history of Nice and houses numerous paintings. 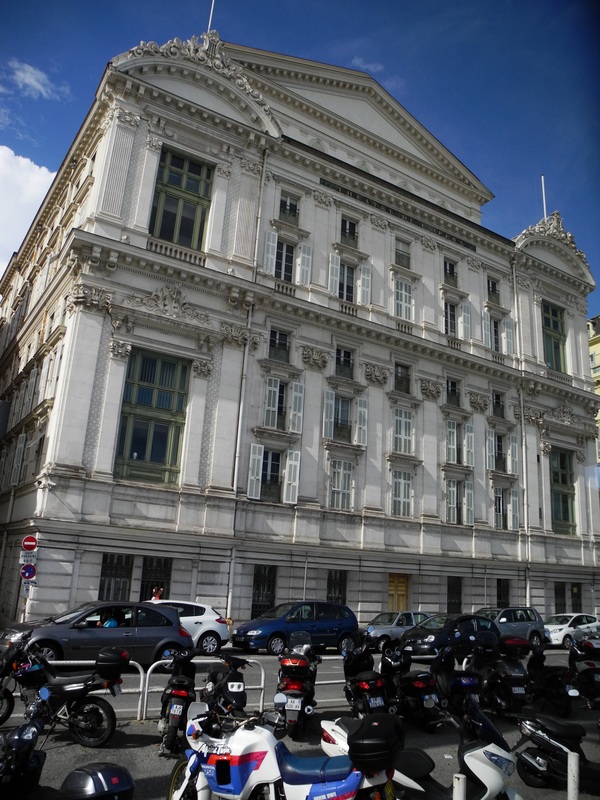 There is also the Musee des Beaux Arts, an Asian art museum, and a museum about prehistoric times.